Last weekend I attended the incredible Special Moms, Special Healing self-care conference and retreat at Candlelight Ranch near Marble Falls, Texas. It was magical and transforming in so many ways. One of the keynotes, Mindy Audlin, shared the concept of “What if it all goes RIGHT?” with a fun, interactive exercise called “What if UP?”. We each stated a desire or need in our lives and then opened ourselves up to receive all the positive “what if” ideas and possibilities from other moms in our small groups. What a stretch and wonderful experience when so many times on our journey of raising a child with special needs, we often dwell in the realm of “what else can go wrong?”. After lunch we were treated to the gifts and insights Renee Trudeau, career/life balance coach and author of The Mother’s Guide to Self-Renewal, brought to share with us about the transformative power of self-care. Her guided journaling exercise gave us each time to get still and quiet in the beautiful outdoor setting while journaling about the four areas of self-care (physical, mental, emotional, spiritual) and which one was most calling to us. It was just what this tired mama needed. Time in nature reflecting on and writing about my own needs and desires. Later in the day came the time when I had to reach deep down inside myself to find the courage and strength to face my fears. And then discover what awaited me on the other side of fear. At Candlelight Ranch, a nature retreat for children with special needs, they call the challenge course the Canyon Crawl. It’s more like walking a thin tightrope across a 250-foot-wide canyon while suspended over 75 feet above the canyon floor. 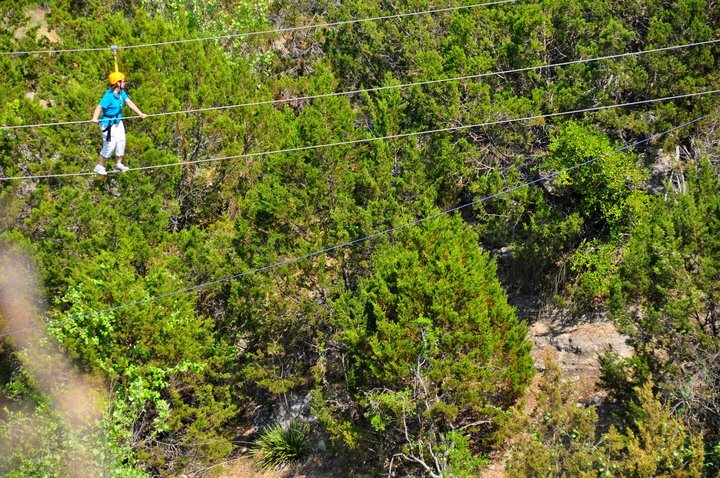 You’re rewarded with an exhilarating zipline trip back across the canyon. When it was my turn to climb onto the “tightrope,” I initially felt like I would burst into tears from being so scared. Then I let go with one hand and made a silly move on the cable beneath my shaking feet. The other moms cheered and I started laughing. As soon I laughed, the fear flew out of me and I knew I could do it. The amazing zipline trip back across the canyon made it all worth it, and I can’t wait to do it again. Like the many serendipitous butterflies I saw that day, I left the conference feeling transformed and renewed in so many ways. This mama had learned to fly! Great post Rhonda! Your website is looking good! Sounds like a cool place for special dads to visit, too! Yes, Bill, it is. I hope you get to visit C.R. soon! Thanks Jen and I’m looking forward to our PRG, too! That retreat was so amazing. Next time, I am sooooo doing the Canyon Crawl! Glad to see your pretty website/blog, Rhonda! Thanks Chris! It was great to see you at the conference and to be in the small group exercise with you. Yep, I highly recommend the Canyon Crawl next time ’round! Wow! Your retreat was awesome!